In 2005, Texas was second only to California in terms of installed wind capacity, with 1,995 megawatts. Now, “we may actually be number one,” boasts Jerry Patterson, the state land commissioner. Most wind farms are on private land in west Texas and the even more blustery Panhandle, but this spring the state signed a lease for the largest offshore wind farm in America, in submerged lands near Padre Island national seashore. Another Gulf of Mexico agreement, off Galveston, was signed last fall. Offshore wind farms are plentiful in Europe, but none has yet been constructed in America. They are in many ways more promising than onshore projects because the wind blows more consistently over the water and, at times of peak electricity use (afternoon in Texas, as the air-conditioning revs up). In McCamey, by contrast, the wind is intermittent : best at night, and in spring and autumn. Economics, not environmentalism, has driven the boom in Texas. The high price of natural gas has also made wind more competitive. 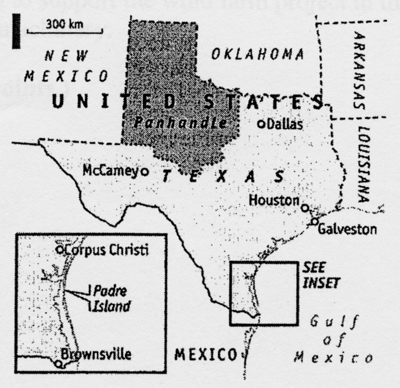 During the 1970s McCamey thrived on oil; now the oil is mostly gone, and wind has created dozens of new jobs for an otherwise withering town. Wind is not without hitches. 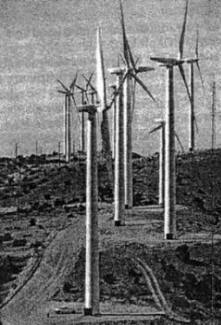 Turbine manufacturers have not kept up with demand, creating shortages. A bigger problem is transmitting the energy over the grid. Texas is a huge state – it is several hundred miles from McCaney to Houston or Dallas – and the utilities cannot build transmission lines as fast as the wind farms go up. The offshore projects, by contrast, are conveniently close to big population centres, though hurricanes will be a problem. The Pentagon’s concerns about wind farms’ interference with military radar – an issue in the upper Midwest, where projects have been halted – have not been raised in Texas. The fate of birds is a more immediate source of contention – especially in the Gulf, which is on the migration path for neo-tropical birds. In fact Texas will try to minimise bird deaths, perhaps by shutting the machines down for maintenance when the birds migrate (conveniently, the migrations occur in spring and autumn, while peak usage is in summer). New paint – easier for birds to see at night – should also help cut mortality.